$651.802 thousand on 46 screens. Plenty of scandals marred the presidential administration of George W. Bush, but not many then leapt to the big screen as “A”-list Hollywood films. 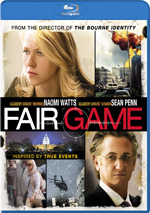 2010’s Fair Game attempts to tell the story of a controversy related to the potential abuse of political power. Set around 2002, Joe Wilson (Sean Penn) and his wife Valerie Plame Wilson (Naomi Watts) are a fairly typical upper-middle-class DC couple. A former ambassador, Joe runs an international business development company, while Valerie claims to be a venture capitalist. “Claims to be” is the operative phrase, as Valerie actually works as an undercover operative for the CIA. She heads an investigation of Iragi attempts to obtain materials to build nuclear weapons; against her preferences, her superiors convince her to recruit Joe – an expert on Nigeria, an involved party – to head overseas and research the issue. When Joe produces his report, he indicates that he doesn’t find evidence that the Nigerians sold uranium to the Iraqis. Which leads to Joe’s surprise when President Bush uses his State of the Union address to claim that the Iraqis did get such substances from Africa. Joe writes an article that discusses his findings, and Valerie soon gets exposed as a CIA agent, effectively blowing her cover. Was this high-powered revenge for Joe’s comments? When I go into a movie like this, I don’t hold it to a high standard of factual accuracy. 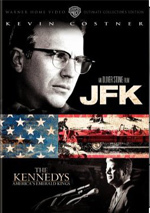 I’d prefer that it avoid the JFK model – ie, that it not provide a plethora of gross distortions and lies – but I don’t believe that it needs to get everything right. After all, no one claims that a flick like Fair Game is a documentary; it’s a fictionalized account of true events. As such, I won’t obsess over how much of Game happened and how much Hollywood invented. However, I will concern myself with the movie’s quality – and how real it feels. In terms of the latter… not very. Some of that comes from the film’s attempt to play as Valerie Plame, Secret Agent Woman. 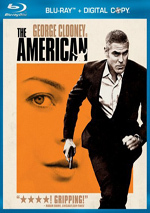 I thought the flick would concentrate on the events that led to Plame’s “outing” and controversies connected to the White House. While those elements play a significant role, the story also often occupies itself with tangential enterprises related to Plame’s gig. That’s where the film meanders and where it feels phony. I don’t pretend to know what Plame’s day-to-day life was like, but I do think that Game paints matters with an awfully “Hollywood” brush. Many scenes feel like they’re part of a spoof; they come across as Big Movie Action with cliché lines and melodrama. This negatively affects the flick’s coherence, partly because it sticks its toes in so many different ponds. We go off on a fairly long tangent with an Iraqi doctor and her nuclear scientist brother. Why? For some cheap drama, I guess; these scenes otherwise lack any real relevance in the story. I get the sense that those behind Game think the movie needs standard action-adventure material to succeed, but they’re wrong. I think it’d work just fine if it focused on the details of the controversy. 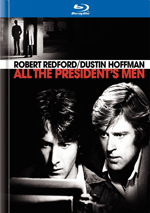 Haven’t films like All the President’s Men demonstrated that an intriguing political tale doesn’t need sentiment and personal drama to grip an audience? I suspect Game could succeed in the same vein, but it lacks the confidence to do so. Instead, it focuses on tired boohooing about the Wilsons’ personal lives and connected topics. Some of this is fine, but those moments should exist as embellishment, not as the main course. Instead, Game often seems to forget about the issues that made Joe and Valerie famous. We spend tons of time watching those two argue and fret, while the film dispenses information mostly via archival news clips. This makes the movie feel more like a soap opera than a political thriller. And not a very good soap opera at that. Penn and Watts sleep through the flick; they offer cruise-control performances without much depth or conviction. Granted, if I had to utter awful terrible lines like “they do not get to take my marriage!” then I’d probably find it hard to invest in my role, too. I enjoy politically-oriented material, and I think Fair Game could’ve been a fascinating look at a modern controversy. Unfortunately, it’s too one-sided and too maudlin to succeed. This is lackluster melodrama. Fair Game appears in an aspect ratio of approximately 2.39:1 on this Blu-Ray Disc. The movie boasted a consistently positive presentation. For the most part, sharpness looked good. Interiors occasionally display light softness, but those instances remained modest. The majority of the movie seemed concise and well-defined. No issues with jagged edges or moiré effects appeared, and edge enhancement didn’t affect the movie. Print flaws also failed to mar the image. In terms of colors, Game opted for a cool palette. It usually went with an aqua tint at most; its tones stayed fairly chilly and desaturated throughout the film. This meant the hues were subdued but fine given the stylistic choices. Blacks were dark and tight, while low-light shots demonstrated nice clarity. Overall, the film came across well. If you don’t think you utilize your surround speakers enough, you’ll feel happy with the film’s DTS-HD MA 5.1 soundtrack, as it made ample use of those channels. Unfortunately, it did so in a poor manner, as it provided the worst-balanced mix I’ve heard in a long time. This tendency first became painfully apparent during an early scene; the sound of a guy chewing nuts came from the back speakers in a surprisingly loud manner that almost made that effect the focal point of the segment. I hoped that’d be an isolated incident, but it wasn’t, as the movie displayed many more sequences in which incidental information from the rear threatened to overwhelm dialogue and more important material from the front. I wondered if this was a simple mistake and the track switched channels by accident. That’s happened in the past, as front and back have gotten swapped. That didn’t seem to be the case here, though; dialogue remained front center, and effects came from the correct locations. The information from the rear simply was much louder than it should’ve been. And that became a fatal flaw, as the mix favored the back speakers to a degree that warped the auditory impression it left. Localization and movement were just fine, and the track provided plenty of information from all five channels; with better balance, this would’ve been a good track. It just couldn’t get the relative volume levels correct. At least the quality of the audio was fine. Speech seemed natural and distinctive, and music was vivid and full. Effects became tougher to judge due to the weird balance, but they seemed accurate and clear enough. Aspects of the track seemed positive, but its failure to balance out the channels created major distractions and left it as a “D+” mix. Only one extra shows up here, but it’s an intriguing one. We get an audio commentary from Valerie Plame Wilson and Joe Wilson, the real-life inspirations behind the movie’s characters and story. Both sit together for a running, screen-specific discussion of the film’s events and their real lives. Expect slow-going during the commentary’s early moments. Dead air dominates, and even when the Wilsons speak, they say little more than how much the like different aspects of the movie. You could skip the commentary’s first 30 minutes or so and miss virtually nothing. Matters improve as the movie progresses, though the track doesn’t really threaten to become interesting until Valerie gets “outed”; that’s the point at which she and Joe offer the most valuable information, and that trend continues until the film’s conclusion. This is a tremendously spotty commentary, but at least it rebounds after an exceedingly slow start. The Blu-ray opens with ads for Source Code and The Beaver. No trailer for Fair Game appears here. With an intriguing real-life political scandal at its heart, Fair Game should’ve been a dynamic tale. Unfortunately, it loses focus of its assets and turns into a bland relationship drama much of the time. The Blu-ray provides very good visuals, but audio suffers from poor balance. It lacks supplements other than an inconsistent audio commentary. Combine the dullness of the movie and the problems with the soundtrack and I find this to be a letdown Blu-ray.